Abbitt Open House List 13-14 April! 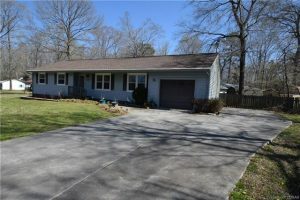 | Hampton Roads Real Estate :: Abbitt Realty Co.
Abbitt Featured Open House List for 13-14 April! Beverly Hills neighborhood. This spacious 4 bedroom 2.5 bath is ready for you to enjoy. Owner has done many upgrades to kitchen, baths and more. Large kitchen with big island for food preparation and eating; beautiful abundant cabinetry with “office” nook area. Inviting den with 1/2 bath is connected to floor to ceiling glass enclosed sunroom. 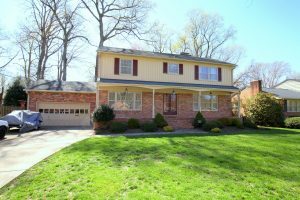 Formal living room and dining room, two fireplaces, hardwood floors, 2 zone heat/air, plantation style blinds, large and deep closets, landscaped fenced yard with shed, on cul-de-sac street, and much more. You don’t want to miss out on this once in a lifetime opportunity to own this extensively upgraded home at this price!! 1st and 2nd floor master suites with walk-in closets, three exquisitely remodeled full baths, added built in office with storage and bath. Beautiful multi-level paver patio with fire pit, lighting and irrigation system. Open kitchen features top of the line appliances & walk-in pantry. Living room features grand cathedral ceiling & bar with wine fridge. Finished room over garage easily converted to 4th bedroom. Generator hook up with portable generator included. Major systems recently replaced and added whole house steam humidifier. Finished garage with plenty of storage & work bench. 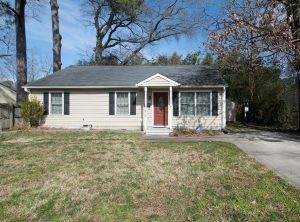 Located in the heart of Gloucester Courthouse, this home has been very well taken care of and lots of updates have been done. All new windows have been installed, many doors have been replaced, fresh paint, new light fixtures, updated appliances, and let us not forget about the Italian porcelain tile that is in half of the home and in the other half beautiful hardwood floors. Both bathrooms have been completely updated to include a master shower that could be featured in a magazine!! Home has an attached garage but also has additional paved parking beside the garage. There is a large back deck with a fenced in yard great for entertaining. Come look at this one first. Huge fenced backyard…3-4 bedrooms. Its up to you is you prefer a great room or an amazing Master bedroom. Almost 1700 sq. Ft. In a very popular neighborhood.Newer roof (2012), 6 month old water heater, most other appliances only 3 years old. Leaf guard gutters, newer garage door. Come see for yourself. Welcome Home! Great house located on a cul-de-sac in Hampton Woods. 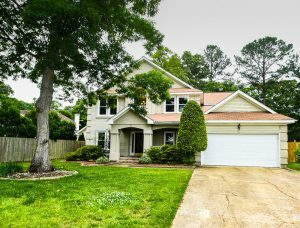 Downstairs boasts a 2 story foyer, 2 sided fireplace, eat-in kitchen with bulter’s pantry, formal living and dining room with tray ceilings, laundry room, and a large step down family room. Upstairs has 4 spacious bedrooms, and 2 full baths. Master bedroom has vaulted ceiling, large walk-in closet, and a luxury master bath with separate shower and jetted tub. Additional building in backyard has windows, is carpeted, equipped with electricity, and pull down attic stairs for additional storage. 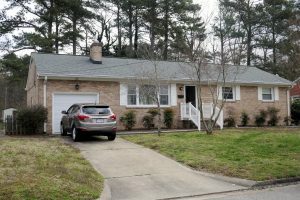 Very close to Sandy Bottom Nature Park, I-64, Langley Air Force Base, and restaurants and shopping at the Peninsula Town Center. You don’t want to miss this one! Beautiful updated home in the heart of Hilton. Just steps away from Hilton Village restaurants and shops, and a quick walk to the Main Street Library and Hilton Elementary School! Fully fenced-in backyard, deck, and firepit that are great for entertaining. Custom-built barn door on laundry room, built-in murphy bed in third bedroom, custom cabinets in kitchen, and numerous other personal touches in this home!